Everyone knows how loyal and loving dogs (and other pets) can be. Today’s picture is a tremendous illustration of this king of unconditional love. It has been said that the relationship between some people and their pets are special and can sometimes touch and help heal the soul. Looking at the face of the child in this photo (and even the dog), is a testament to this fact. “A dog is the only thing on earth that loves you more than it loves itself”. If you Need A Smile Today…You Need to Watch This! Every once in a while, I come across a video that brings a smile to my face and makes me want to watch it over and over. 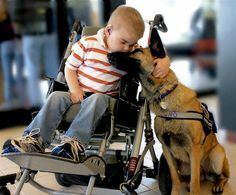 We all know that there are special bonds between people and their pets but there seems to be something really beautiful, joyful, and innocent about a toddler and a puppy. What’s makes the video even nicer, is listening to the toddler squeal in delight as his pet plays with him…then gives him a special treat at the end. If this little video clip doesn’t bring a smile to your face…nothing will! I came across a heartwarming photography page that portrayed many photos taken by Russian photographer, Andy Prokh of his young daughter, Catherine. It is quite evident why she loves her little friend so much and how much they enjoy playing together. It reminded me a lot of my time with my pets when I was growing up. The following are just a few pictures from this main page, Design Taxi.com I am sure that you will enjoy the pictures as much as I did. I invite you to check out more of there pictures on this web page. Enjoy the day and the smiles that you will experience!